Tag Archive | "homeland safety"
Hours before the “Torture Report” was release by the Senate, former speechwriter for President George W. Bush Michael Gerson wrote an op-ed where he called Senators Feinstein’s and Udall’s decisions to release the report reckless in what he referred to as “a massive dump of intelligence.” In making his argument, Mr. Gerson misconstrues principles of international law that should be clarified while also setting a dangerous precedent. Mr. Gerson attempts to equate President Obama’s drone program with President Bush’s torture program (Mr. Gerson does not use the term torture, instead opting for “harsh interrogation,” most reviews of the report conclude that the CIA engaged in torture). Mr. Gerson states that there is only “a subtle moral distinction” between these two attempts to keep the United States safe. However, there is more than a subtle moral distinction between these programs, one that calls his argument into question. 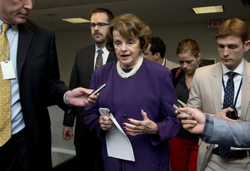 In this June 3, 2014 file photo, Senate Intelligence Chair Sen. Dianne Feinstein, D-Calif. is pursued by reporters on Capitol Hill in Washington. Secretary of State John Kerry asked Feinstein on Friday to “consider” the timing of the expected release in coming days of a report on harsh CIA interrogation techniques. One of these programs can be justifiable under international law while the other can never be justified under international law. Before establishing these distinctions, it is important to highlight that Mr. Gerson points out in his piece that this torture report is being released in “the middle of a war.” This is important because this sets parameters of acceptable actions. During a time of war, which the United States has engaged in since September 11th, 2011, the use of force that results in the loss of human life is permissible so long as it meets the jus in bello requirements. This requires the use of force to be proportional, necessary, and utilize distinction. This is in opposition to torture, which is never justifiable under international law. The United Nations Convention against Torture and Other Cruel, Inhuman or Degrading Treatment or Punishment specifically states in Article 2(2) that not even a state of war permits a state to engage in torture. Therefore, there is more than a moral distinction that separates Obama’s drone program and Bush’s torture program. Obama’s program has a legal foundation in international law if certain conditions are met while Bush’s program is a violation of international law no matter the circumstances. This brings me to Mr. Gerson’s more subtle implication in his piece. He warns President Obama and Senate democrats that in the future a different Congress may want to look into the current drone program. Mr. Gerson’s veiled threat implies that because they are investigating President Bush’s torture program, they are opening themselves to similar investigations by future administrations and members of Congress. Mr. Gerson’s threat is disturbing. The United States is supposed to be a nation of laws. The Senate is investigating the torture program because it appears to have broken international law. Mr. Gerson suggests that holding United States leaders accountable for violations of international law is nothing more than political posturing. This suggestion undermines the foundation that the United States is a nation of laws. While President Obama’s use of force may be justified under international law, I do not necessary claim that it is. President Obama and his administration have failed to publically articulate how its drone program meets the requirements of lawful use of force under international law. Congress has a duty to investigate President Obama’s drone program to ensure that it is lawful. This duty comes from Congress’ oversight role, not from political revenge as suggested by Mr. Gerson. And if Congress concludes that President Obama’s drone program does not meet the principles of international law (proportional, necessary, and utilizing distinction), then they should take the appropriate legal actions to ensure that the United States protects its foundation as a nation of laws. Wesley Fry is a 2014 graduate from University of Denver Sturm College of Law and former Editor-in-Chief of the Denver Journal of International Law and Policy.